Festival Time! Socialize and Share! Yes the time of year is here that I am always exited about. Festivals and Shows are nearly every weekend again and that means Fun for me. 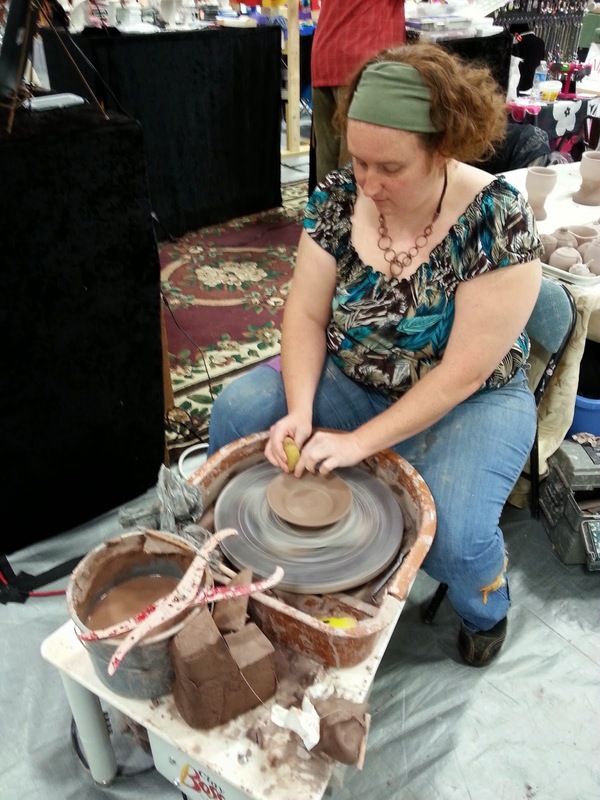 It also means I get to meet more of my fellow artists including potters. While I many not always fit in with my normal Ceramics crowd I am always happy to meed and get to know those in the area, and those from out of town. Each person I meet I feel adds to a bit of my art be it from inspiration of their work or their spirit. For example this past weekend I had a good time at a local event that allowed me to spend time with one potter a Crystal/Jewelry artists and a number of Wood Workers that inspired me to new heights. My Ceramics friend was local as well, though our paths had yet to cross. He too makes his own glazes and we exchanged ideas. His style is drastically different from mine, though his lines are wonderful and he has a wonderful eye. He seems to have a natural instinct for when and how to add Relief to the surface that I have always been uncomfortable with. He has inspired me to push myself in future and do more of my surface carving on my utility work rather then only my sculptures. A number of wood workers and I spoke a great deal on the different techniques required to make a similar item on a Wood Lathe as on the Potters Wheel, bringing back a project I had in mind of working with a wood artist or learning on my own and having some mixed media pieces that will be wood and Stone to show two forms of natural yet controllable art. I have been sketching out projects and will me working up a sires I hope to try soon. My wonderful neighbors were Crystal Jewelry Makers, making amazing products out of jewelry and creating rainbows out of lights. Their work inspired me to look at my glazes and work on a glaze that could be affected by the light in a way that would replicate the spirit of a prism. Also it was discussed how there are two ways for an Artist to react to other artists of the same type. Many take the road of "Competition" be it friendly or otherwise, it is natural for us to compare and try to defend what we see as our territory. While I have always thought of my self as the other, an eternal Teacher and Student. I try to step back and remain humble in my work. While it means describable things to me my techniques are those that were perfected of the centuries not in my lifetime. I do not hold back "trade secrets" to make my own work seem more unattainable. I share my knowledge and try to gain more as I go. I find when I remind myself I did not invent these pieces I stop and see that those around me have work very different from mine in look, function, style, origin. These are the things that keep us from being on competition, and those that are looking to purchase from me are interested in my style, while if they would like the other style they will shop with my fellow artists. I have found over the years it is my spirit and style that draws people to my work, along with my craftsmanship and function. So when people as me how I do a technique I am happy to share without fear they will take my idea and be competition. Inspiration is a good step weather it is my own or some that I share with others.